Welcome to Loser Sons of Politics, a new column where the politically minded among the Jezebel staff recall with fondness the antics of the loser sons of politicians. Today (because it’s a very big and special day for the former Arkansas Governor), we’re recalling that time Mike Huckabee’s loser son David killed a dog at Boy Scout camp by hanging it to death. The story, of which we were reminded by an alert reader, begins when Mike Huckabee’s youngest son David was 17 and working as a counselor at Camp Pioneer in Hatfield, Arkansas, in 1998. One day, David Huckabee and a 19-year-old fellow counselor named Clayton Frady came across a stray dog. The pair of young men captured the dog, and then killed the dog (some accounts say that they hung the dog to death; others differ). As a result, both David Huckabee and Clayton Frady were relieved of their duties as camp counselors. Of course, you can’t control the actions of a separate human being, especially a 17-year-old male one. But Mike Huckabee can certainly control Mike Huckabee’s actions. According to a Newsweek piece about the incident, rather than forcing his sociopathic chip off the old block to face legal ramifications for killing a dog because the spirit moved him, a law enforcement official who worked on the case says then-Governor Huckabee intervened with attempts to investigate the dog’s death. But John Bailey, then the director of Arkansas’s state police, tells NEWSWEEK that Governor Huckabee’s chief of staff and personal lawyer both leaned on him to write a letter officially denying the local prosecutor’s request. Bailey, a career officer who had been appointed chief by Huckabee’s Democratic predecessor, said he viewed the lawyer’s intervention as improper and terminated the conversation. Seven months later, he was called into Huckabee’s office and fired. “I’ve lost confidence in your ability to do your job,” Bailey says Huckabee told him. One reason Huckabee cited was “I couldn’t get you to help me with my son when I had that problem,” according to Bailey. “Without question, [Huckabee] was making a conscious attempt to keep the state police from investigating his son,” says I. C. Smith, the former FBI chief in Little Rock, who worked closely with Bailey and called him a “courageous” and “very solid” professional. This old anecdote was dredged up in 2007, around when Huckabee was discussing running for President (and not long after the time David was arrested in Little Rock for trying to board an airplane with a gun. Classic Loser Son!). The story surfaced again early this year, after Huckabee made the very dumb strategic move to flap his gums about the Obamas’ lax parenting because they let their teen daughters listen to Beyoncé. After the dog-killing incident, David went on to attend Arkansas State University, an institution he says he selected partially due to its proximity to good duck hunting. In an interview with the campus newspaper his freshman year, he said that after college, he hopes to “either be the President or to be the one who makes the President the President.” He also doesn’t want people to like or dislike him for who his father is, but for who he is as a person. “Don’t judge me before you know me. “I’d rather people just judged me on my personality and my character and my integrity,” he said. Know any dirt about some dumb politician’s loser son? Email us. 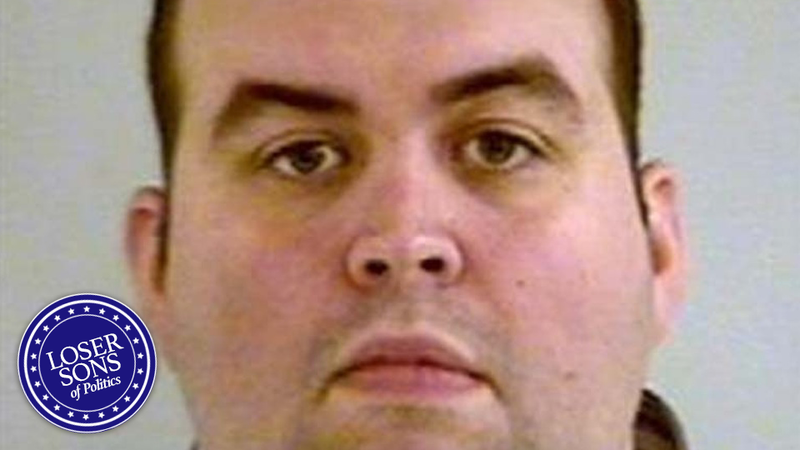 Image: David Huckabee’s mug shot shortly after his arrest in 2007 at age 26. Yeah, only 26. I know, right?